Picnic after a fall ! Humpty Dumpty had a great fall... Every now and then I always thought that the big size I sport is going to come in the middle of things - but I never really knew what middle was going to AUG 1 .... with the onset of the August, while I was making big plans on how I am going to turn my life around for that month... A little rain matter splattered around on the tiled floor of an office complex gave me away. I fell and long story short I was told to not get out of bed and put weight on my right leg for the next 6 weeks. Which meant breakfast lunch and dinner in bed. Sounds like a perfect plan for maybe a week. But 6 weeks was a bit too much to ask. Post 6 weeks when I went to see the doctor, There was an extension of another 2 weeks... and before I knew it another 2 weeks turned into a whole 3 months. But Last Wednesday, in the scorching mid October heat I went to see my doctor... with a resolve and as it turns out I am now allowed to get back on my feet. Humpty dumpty sure has a few added extra kilos, but who am I to complain when I can get out of my house... go to the many dinner parties which I have missed and catching up with my friends ... Go to a movie theatre and finally enjoy the freshly popped pop corn... oh the small joys of life !!! And with a basket full of good news .... this morning Kunal woke up on the right side of the bed and asked me if I wanted to go on a holiday.... A HOLIDAY !!!! He said ok - dont get excited. Not a vacation holiday of sorts... maybe a short weekend get away... picnic types... he was quick to add.. !!! And ofcourse when things look so bright its time to type away I told myself. This happy news of my re-entry into this beautiful world required a visit to my blog too !! 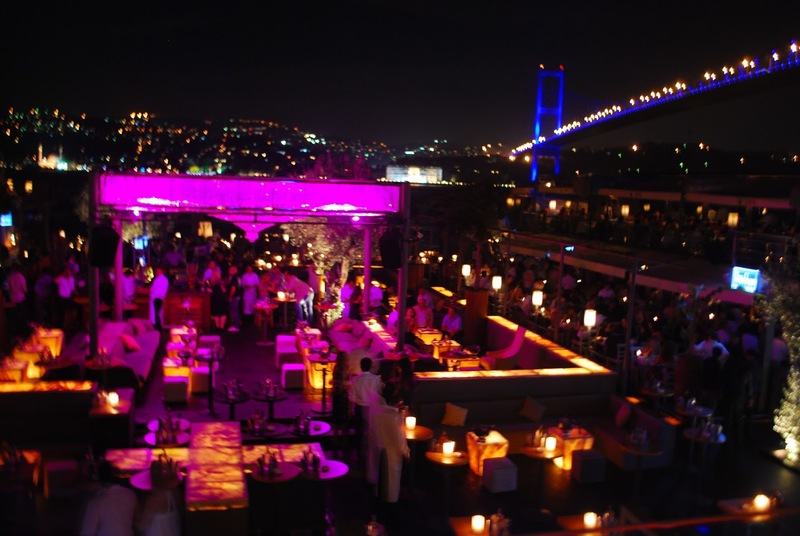 Istanbul: a mash-up of East and West that vibrates to the rhythm of techno Sufi drums and daily prayers. The city is an expanse of neighborhoods’ that stretches across the tips of Europe and Asia and – even while supporting a population of about 20 million (not all documented) The red bus guided tours had some different numbers to what the tourist guide had to tell us – it has managed to organically unearth itself amongst the hills inbetween the Marmara and Black Seas. Despite this city’s green serenity, the locals carry the age old conflict of East and West within, something clearly visible when one compares the old city surroundings and the chic neighbourhood of Ortakay. Thankfully for the traveller, no one in Istanbul is willing to give up the time-honoured legacy of Turkish hospitality from their lost empire. So while the workday moves at a snail’s pace between tea breaks and nargile puffs, the nights are packed with an affable energy that threatens to sweep a visitor off their feet if they don’t mind their ‘ç’ and ‘ș’. Attention to the details of everything pleasurable: food, company and beauty is an essential part of Turkish culture. Istanbul residents’ commitment to this satisfaction of the senses seduces the nose with roasted hazelnuts and perfume, the eyes with the distorted colours of glass lamps, the heart with the salons of homes, and the imagination with the greenish blue eyes of that girl/guy sitting across from you at the cafe. 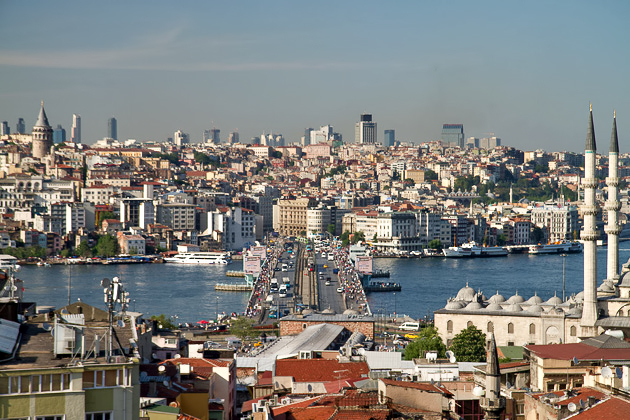 The historic Sultanahmet on one side of the Golden Horn, the fun European side of Beyoğlu and its many suburbs on the other and the Asian side divided from the rest of the city by the Bosphorus. All are fascinating and all have their own attractions.The most important thing to do when planning a trip to Istanbul is to allow enough time to explore. Too much to see and too little time is a common catch cry from those returning after a visit to this wonderful city. The palace was the home of the Ottoman sultans during the 15th to 19th centuries. Four courtyards with beautiful gardens and fountains surround a multitude of buildings housing the Harem…a must see, we Walked to the end of the garden for a fabulous view over the Sea of Marmara.. all while enjoying a dollop of ice cream at the café to beat the heat. Built in 537 as a Church, it later became a mosque in 1453 and finally, in 1935, a museum. You will be in awe of its beauty as you stand under the dome taking it all in. Take the steps to the gallery where stunning mosaics dating back to the 12th century can be seen. 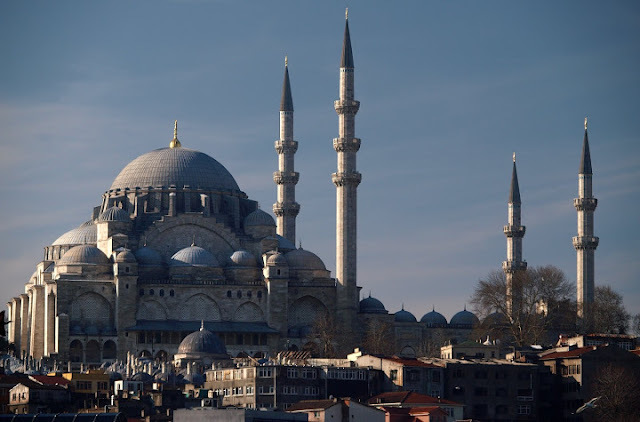 As one of the most beautiful buildings in Istanbul it is a sight that shouldn’t be missed! Across Sultanahmet Square facing Aya Sofia stands the city’s main Mosque with its six minarets. It is known affectionately as the Blue Mosque because of the blue Iznik tiles that decorated the walls. You need to make sure you are suitable clothed to enter this mosque. But worry not, they will further cover you up anyway. You will have probably walked over the Hippodrome without realising that this was once the scene of chariot races and the centre of Byzantine life. Three statues still remain here. The Museum of Turkish and Islamic Arts also overlooks the Hippodrome. 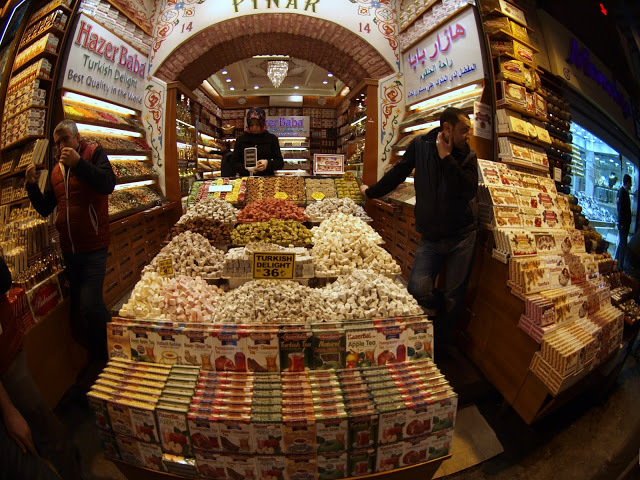 I can guarantee you will get lost in the maze of streets and passages that is the Grand Bazaar. Each trade is congregated in its own area: carpet sellers in one street, goldsmiths in another. There are some good buys on the leather street whilst the arts and crafts, ceramics and brassware areas may also tempt you. You’ll need a rest at some stage so pop into the Fez Cafe in the centre of the old part of the market for beautifully served refreshments and to plan your next stop. Despite many warnings from everyone who has ever been to Turkey, We got lured into buyinh Turkish tea. With Love tea that looks like pot pourri and Apple Tea which tastes like heaven, do you blame me ? Fishermen line both sides of Galata Bridge day and night. On the level below you’ll find a wide range of fish restaurants. As you walk from the Eminönü, the Galata Tower rises like a beacon. Walk up the Camondo Steps, or take the street that leads you pass the music shops. The historic funicular that runs from Karaköy to Tünel may just be the answer for those that do not like hills! 7. Walk the length of İstiklal Caddesi to Taksim.Keep walking up the hill from the Galata Tower and you will reach Istanbul’s famous pedestrian avenue, İstiklal Caddesi which you can take all the way to Taksim Square. 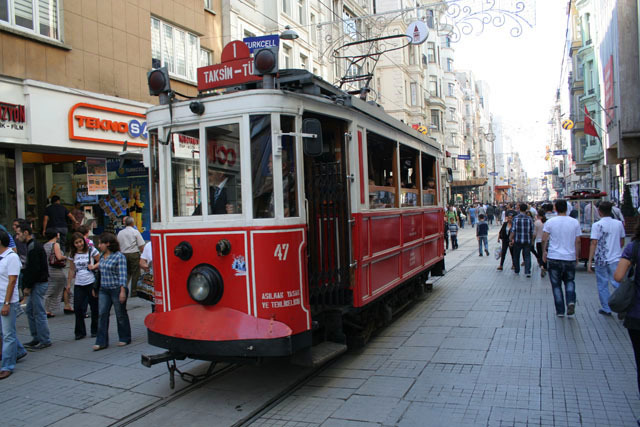 If you don’t feel like walking, one of the famous historical red trams will be only too happy to take you! Explore the side streets that lead from here…there’s a whole new world waiting to be found! 8. Smoke hookah. Argilah, nargile, sheesha, hubbly bubbly – whatever you call it, there is an ample supply of hookah bars in Istanbul where you can lounge around while you smoke the water pipe and sip on a class of tea or coffee. 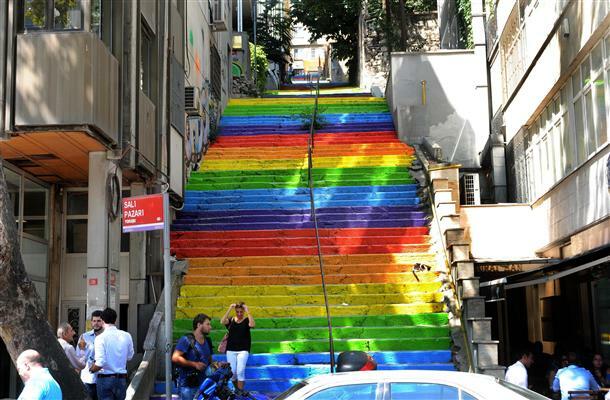 A local resident painted the stairs to brighten the area but two days later the council painted over them in boring grey! There was such an outcry that they were redone! There are now quite a few stairways in the area that have been painted. 10. Taksim SquareTaksim Square, known as the heart of Istanbul, lies at one end of Istanbul’s famous Istiklal Cadessi. The Independence Monument, at the southern end of the square, commemorates Attaturk’s roles as military commander-in-chief and as a statesman. To the north, Cumhuriyet Caddesi takes you to Nisantasi. If you come to Istanbul you have to drink tea out of a tulip-shaped glass. Turkish tea is prepared in a rather unique way using a teapot that has two level: one to boil the water, and the other to brew the tea. You then pour the tea into the glass and dilute it with the hot water so that it’s made to your taste. 13. Roof top BarsWatching the sun set from one of Istanbul’s many roof top bars is a must! 360 is one such, pverlooking the golden horn is my favourite in Istiklal Caddesi. Just around the corne. 14. Last and by no means least….eat lots of Turkish food!Where to start…you’ve got to try it all! From the many fabulous bites offered on the street, to cheap and hearty meals to high end restaurants n clubs…Istanbul is a gourmet’s delight. Eat a sesame seed covered pretzel. You can pick up one of these tasty pretzels at any bakery in town, but I suggest you grab one from the little red stands along Istiklal Avenue. It just adds to the experience. Eat Turkish pizza. Lahmacun is considered to be the Turkish equivalent of pizza. This thin dough is topped with vegetables and herbs. Or a hearty portion of Kumpir,,, mashed baked potatoes with herbs cheese n vegetable salad !!! my heart yearns for it each time I think of it. We went to some stunning restaurants .. REINA which later turns into a club is on the top of the list of every food blogger, tourist list, local list. And it has rightly earned its place there. I am yet to eat a better warm goat cheese salad which topples my senses like the one that did at Reina. Paired with some amazing wine I thoroughly enjoyed my Pizza too. We were later shifted to the club which played a mix of the best international hits. For a quite date night my husband Kunal and I would recommend Angelique on a weekday. A table by the bosphorous makes for a romantic setting, no ? We also dined at Sortie – the club which boasts many restaurants, Cinquo per Cinquo being the Italian Fare.... with some amazing Cocktails ! Ofcourse with all that fine dine, we kept lunches to street fares and an afternoon having some finger licking hummus and pita-falafel sandwiches at Falafel House ! Ask for a vegetarian menu and they will be happy and accommodating. Have you been to Istanbul? Are there any places you think should be added to this list?If so, I’d love to read about them in the comments! Cheese-pedition as I called it yesterday ! I am one to go to www.bigbasket.com or swing by my neighbourhood Nature'sBasket to buy my cheese. Every since I first attended a cheese part back in Belgium - where I was exposed to 20 different cheese on a platter I realised what a big deal this whole cheese business it. We only knew of amul and Britannia and the cheese world came to a screaching halt ! My second host mom is an experienced cheese-maker and in the few months I lived with her an an Exchange Student, I've watched her play with curds and whey, experimenting with a vast assortment of exotic cheeses. It's definitely one of those things that gets better with practice. Many things can go wrong and they probably will. So I suggest starting with a simple cheese in the beginning, like mozzarella. Plus, it doesn't need to age. Instant gratification! There is nothing better than a caprese salad with your own homemade Bocconcini. I mixed them in with yellow cherry tomatoes, fresh basil, lemon, olive oil, salt and lots of black pepper. Here are 3 cheese-making kits I recommend for your very first batch, all of which I've never personally used or gifted to others but have seen in peoples home of on some famous blogs that i follow !! Cheese, Say Cheese, Cheese Please ! Hope you are going to aim at eating lots of CHEESE today... today is National Cheese Day, ofcourse that is in america! The good people of AMUL Co-operative are you listeneing ? We need a cheese day !!! I'll be marking June 4th on my calendar to celebrate properly next year with one (or ten) of these cheesy recipes. Ofcourse, watch this space tomorrow to learn how to make your own mozzarella! I am on a cheese-pedition !! Happiness is officially contagious! A Harvard study followed 5,000 people over the course of 20 years, and found that positive emotions spread up to three degrees removed from the original source. Which means, we transfer our happiness to people we interact with directly and to people we haven't even met. Like a chain reaction. When we feel good, you can bet a friend of a friend of a friend will feel good too. And the effects last up to a year. I absolutely love this concept, don't you? Right now, make a conscious effort to spread your positive emotions to others. Get happy. Do whatever necessary to raise your vibration and elevate your mood. As you interact with people, visualize yourself transmitting a contagious "happy virus" to them. Notice the positive effect you're having on others. And yourself. Revel in the fact that your positive emotions will spread to people you don't even know and touch more lives than you ever thought possible. Hello Lovelies ... I hope everyone is feeling their toes and fingers and all 20 of them !! I am still finding my bearings post my little episode yesterday. I was required to go under a full body anesthesia. It was very scary. I was also attached to an IV drip with glucose... Yes the worst is behind me and now I am snuggling with my lover sipping on some Iced Tea. But apparently when I was in the under world, of course I don't remember any bit of it but Kunal tells me I kept weeping and saying I don't tell him enough how much I love him... ! I still dont know whether that is true of not, whether I really feel that I don't appreciate him enough, I would like to take this moment and tell him how much I Love you Kunal Shah... ! He sat right next to me through the entire morning. Got me fresh juice and water to sip onto all the way back from the doctors. And even when I was home, he propped up the pillows, tucked me into our marital bed and got me some soul food. I am so very lucky to have him !! I don't know many men who would sit next to me all day, each day and listen to me talking about my unusual dreams, telling him what to do if I die and informing him time and again on the way to deal with the world knowing fully well that I married him because he was world wise in the first place !! Kunal is the sort of confident guy, who just knows how to make the smallest things seem oh so important and the biggest thing seem surmountable all the time. He is the reason why I have learned how to relax.... he is the reason why i know what things to priporitse and give my everything to. Kunal, you make my world go round ! Thank you love for being my everything !! For today's Etsy Faves, I invite you into my English cottage garden surrounded by sweet smelling blooms to soak up the sun in our vintage floral frocks and sip rose petal tea. Won't you join me? 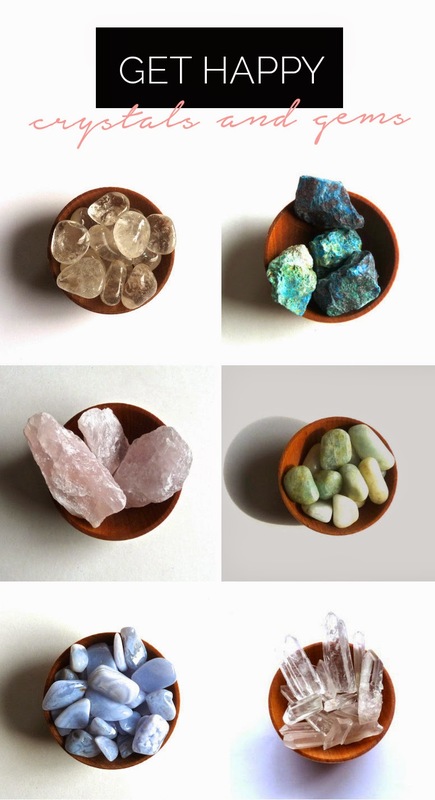 Friends, I consider myself lucky because I am spiritual. And because i know there is a god above me, I feel I am in a happier space. Using the definition of spirituality as an inner belief system that a person relis on for strength and comfort, it makes perfect sense. A University of British Columbia study found that children are happier when they feel that their lives have meaning and value. Numerous other studies, many conducted by agnostics, have also demonstrated a close link between spirituality and happiness. A strong internal life purpose enhances our wellbeing. I am grateful my mother led me down a loving spiritual path while I was young. Ofcourse in India spirituality and religion are often confused, inter changed and used as per convenience. But over the years I have understood that her taking me to a religous meet was not to force me to choose a path led by religious leaders. It was infact encouraging me to question the world, think for myself, and believe what feels true to me. Does it make me a happier person? I think so. It's this connection to a higher power, something greater than myself, that allows me to feel confident and secure with my place on this earth. What do you think? Do you consider yourself spiritual? If so, does it positively affect your mindset? If not, in what other ways do you fill that space? Leave your comments below - I'd love to know! The only answer to our [unhappiness] is a pleasure which comes not from the body but from a place deep within us. I am a last minute kid. I studied last minute for exams… I wait for the very last day to fill out visa application forms .. I wait for the very last second before I absolutely need to get dressed for the day… And like all other things I waited for 15/05/2015 to happen to download the #MyntraApp ! I have been the last one to get onto technology ALWAYS. So today – at the very last minute, when I logged into the Myntra website for my Saturday routine.. I was told it has moved to greener pastures – I finally caved. I Went to the APP store, downloaded Myntra and now it is on my home page along with the others - WhatsApp, Facebook, Ola, Zomato, Photo Editor, Instagram and many more. I have joined the bandwagon. Logging into apps is now just a few clicks to log u in… Immediately I hit on the sort and refine button to see if there were plus sizes available..I have always been a plus size kid – so shopping for me was disaster. With those nasty comments by the retailers, I hated going shopping to see the sheer disappointment in my mother’s face. Somewhere in between what I liked or loved to finding the correct size for me in the ladies department when I was only a child – I kind of hoped that there was a magic wand I could wave – That I wouldn’t have to make all those disappointing trips between the trial room and the ever shrinking number of designs available as I grew not only in age but also size. It’s not that I am ashamed of my body weight… I am very much confident under my skin. 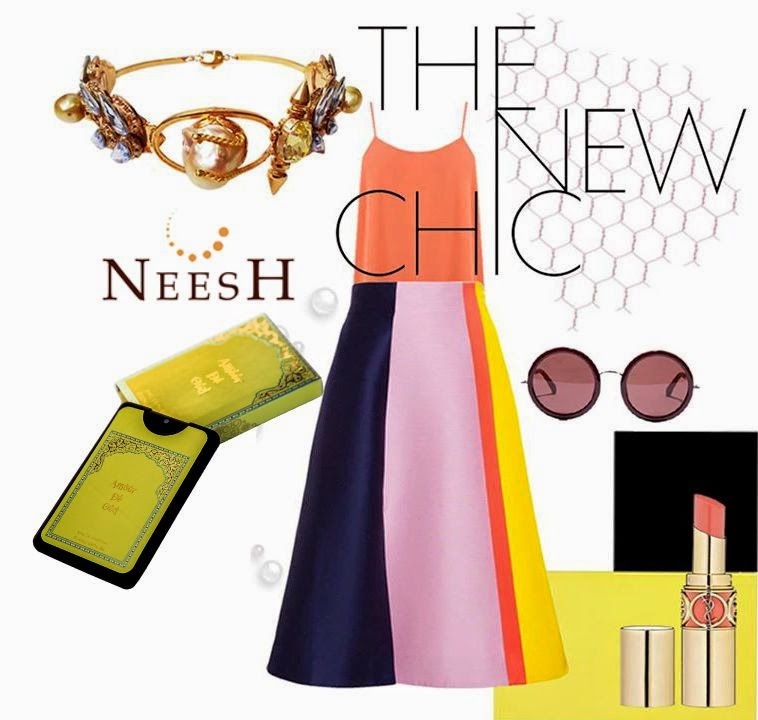 But if fashion has progressed – I am happy that it is empowering me. 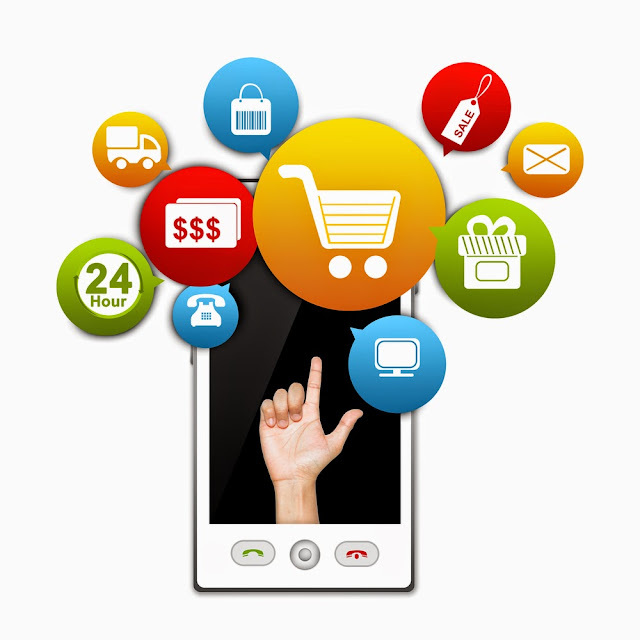 I salute companies like #Myntra who have made the big move to an app … Big, pun intended. I cannot even begin to imagine what a relief it is to put those filters of size and colour to sort out through the crazy big collection that they have. I mean if only the actual retail store had that filtration process, it would have scared me lesser. And all this, without wasting my actual time – TIME is always shrinking when you are in my line of business ! I also always wished there was someone who would just put together a wardrobe for me. When I first heard about a profession called a STYLIST, I secretly decided that if I became rich, I will hire one to put together looks and details for me. Now, my mother may call this whole putting together a “LOOK” fraud ! But I say #Myntra you are my #bff. It’s like I am 15 all over again discussing over my fancy new mobile phone on what to wear to college with a friend – she would know my entire wardrobe. I still reach out to my phone – only to pull together something without all that mindless chatter. So here I am spending a better part of my Saturday afternoon sipping coffee snuggled up on my sofa with my phone... what started off as a little breather has just made my weekend shopping bright. What would take me an eternity, toiling in and out of the crazy bandra shops for the junk followed by an evening at Palladium for the funk, I wrapped up the rhapsody and used the time to enjoy doing NOTHING ! Happy Weekend Cheer and Beer to everyone ! I want to blame travel magazines, tourist shops and souvenirs that I have received from Mexico before I actually got there for showing me a different Mexico. So blame me for thinking Mexico is Colourful buildings with bougainvilleas dropping low, almost touching the ground. Or I wasn’t wrong while dreaming of houses with cactus growing and women wearing very colourful clothes while knitting in their verandas. Of course I knew mariachi’s won’t be singing while I waltz hand in hand with my husband .. We first landed in Cancun – where I saw American tourists. You can’t count the Mexican imposters sitting in traditional clothes on the way to Cichen Itza ofcourse. Then in Mexico City – which much like Mumbai was abuzz with life, trade and commerce thriving on its streets and Malls filled with the noveau rich buying the American dream. Then to Los Cabos – which is a luxury beach va-cay with bikini tops and flip flopped men and women enjoying way too many margaritas. So where was this picture perfect Mexico from my coffee table book ? It was not until I reached Todos Santos that I realized,Much of my Mexican Dream was right here ! Having read a handed down version of Lonely Planet –Mexico from many years ago and I quote “the once treacherous road from Cabo San Lucas, about 45 miles away, has been paved, making the town too accessible to day tourists.” And it’s true. The beautiful Transpeninsula Highway takes about an hour of straight driving before you get Todos Santos. A map was handed to us by our hotel concierge. But no sooner had we entered this town we realized how really SMALL it was. We passed two landmark buildings on the map in less than 30 secs on one street. The entire town was a 3 street by 3 street affair.When we parked in one corner of the tourist-town, I say Tourist-Town because I only include that part of town which was on a Tourist-Map .. rest all I am assuming is Residential. We walked down the Benito Juarez - the main street. Garish villas are starting to mar the pristine landscape. It looked like developers are going to take over these ranches soon enough for boutique hotels. Just like the few chic, small hotels in town, like the Todos Santos Inn as well as the Hotelito, a modernist-looking property that I read are run by EXPATS.Another thing that makes this town famous is the Todos Santos Music Festival, which was started by R.E.M.’s former guitarist Peter Buck who is a part-time resident of this quaint town. 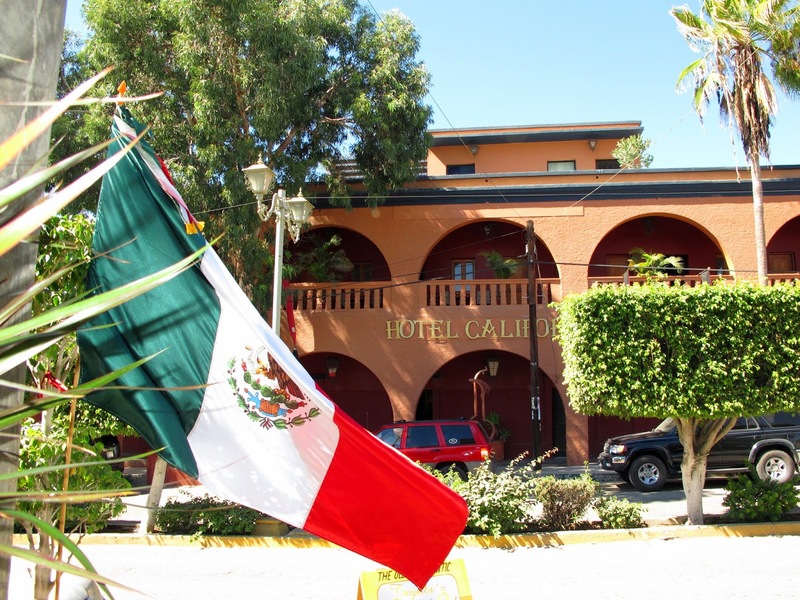 Our first stop was to go see the Legendary Hotel California – rememeber that song you all ? It is debateable, I understand .. But the property boasts Hotel California was made there … AMEN ! We then sat right across the hotel in Restaurant Tequilla Sunrise. 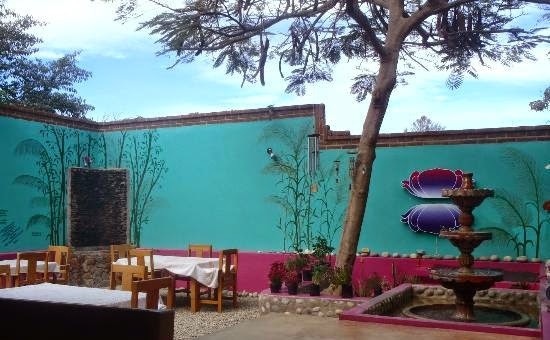 Like people will tell you, Todos Santos is still small enough that if you’re looking for someone you can simply go to the handful of Cafes and Souvenir shops that line the 3 main streets there and find them. And if you dont just have a Damiana. 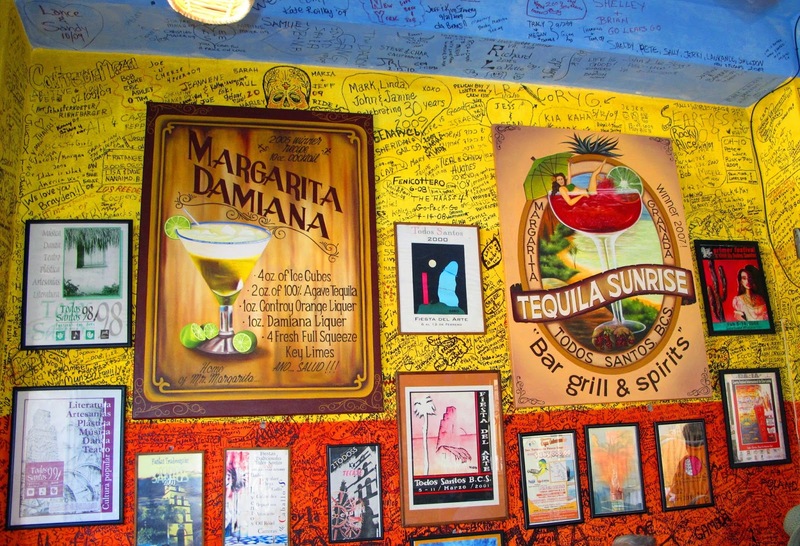 Tequilla Sunrise introduced us to Damianas. Damiana Liqueur is a light liqueur made with the damiana herb that grows wild in Baja California, Mexico – that’s what the waiter will tell you… What it actually is, it is a mocking down tequila version of a margarita- very popular indeed. What I loved about this little town were the restored adobe building in the center of town, which serve as various resurants, café and arts centers. Mexican arts, crafts, bookstores, restaurants, realtors and galleries are worth a visit, Leather goods, 100% cotton dresses, shirts and pants, Mexican woven blankets, furnishings and carpets are among the many things to choose from all thriving in this 3x3 matrix ! Tour the Galleries I would recommend .. As an artist town, Todos Santos has many galleries full of everything from paintings to handmade copper work and ceramics.. There are many resident Artists who sit there every Thursday sketching painting and in their element. Ofcourse TODOS SANTOS is really known for its SURFFING... We didnt end up doing it.. but definately the blue waters were a sight to see. 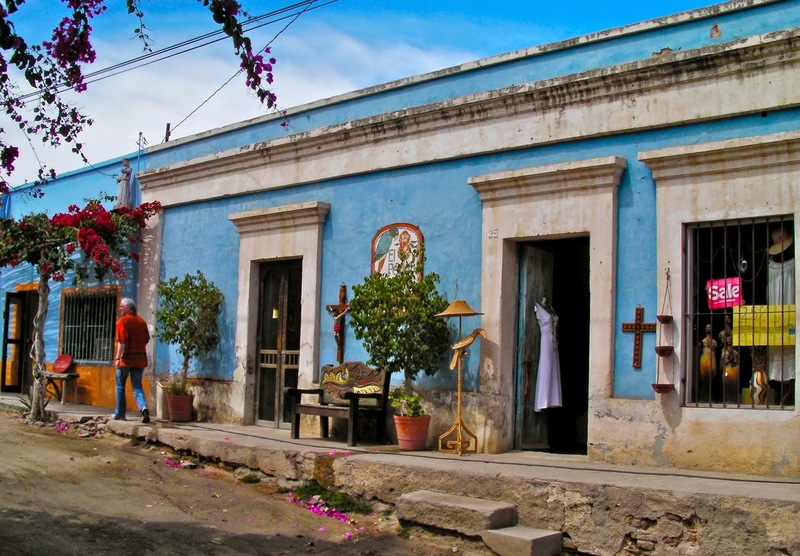 No wonder poeple call this the dreamy town of TODOS SANTOS. Done with our tour, no place is complete without its food. We all turned towards Vira, who throughout our journey has pulled out gems from her Google Search and restraunt reviews. We stopped at Rumi Gardens.. the food is organic, fresh, healthy and prepared with love and gratitude. The price is just right too. We enjoyed the indoor ambiance with water fountain and Rumi affirmations that made this place very spiritual. Something like a yoga retreat but only with fresh basil vietnamese rolls ! Afterward, as you stroll home, you can still hear the sound of distant roosters and old, sputtering pick-up trucks blaring scratchy ranchero music... this is Todos Santos !